I really like panel 1 on this page, but I’m not sure why. I think it’s because the angle really gets across the look of the Hatchet’s wing digging into the street and tearing it up. Or maybe it’s because lots of things go “boom” on this page. If you are a guy, I would say it is the BOOM factor. Otherwise as an artist I feel the way the page turned out is what makes you feel good. For all others it could be a little of both. 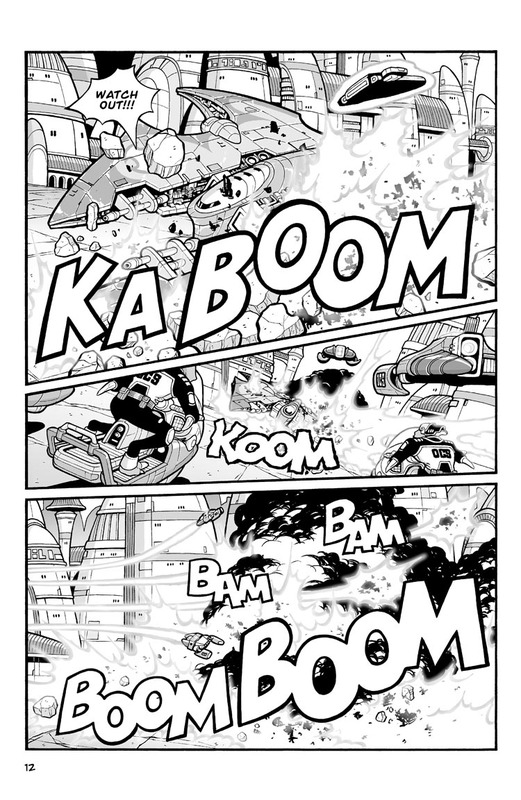 Often I don’t like seeing sound effects expressed as words and would rather just see the art…In most cases it’s pretty obvious when something goes BOOM without actually writing BOOM. I agree, Vid. In a previous post, I also mention being conflicted about whether to include sound FX or not. I think it’s pretty much an institution in comic storytelling, but then books like Marvel’s The Ultimates do a great job of conveying action without any sound FX. At this point, while I’m not leaning away from sound FX completely, I’ve definitely lessened them a bit in the new story.